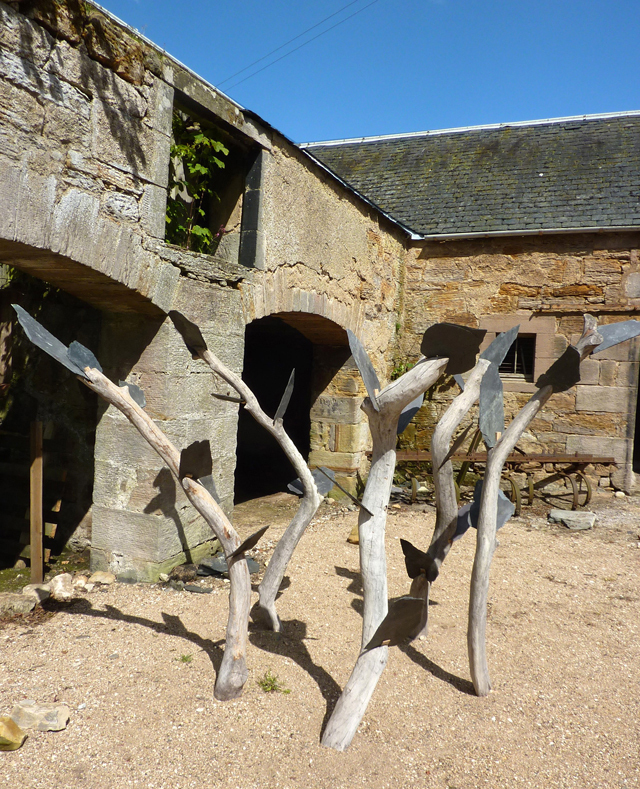 The installation explores the connection between art and horticulture, reflecting future plans for the Stables at Cambo Estate which will incorporate the two. Horticulture is more than simple gardening. According to Relf (1992), the contemporary definition of horticulture has been expanded to encompass several disciplines: the art and science of plants resulting in the development of minds and emotions of individuals, the enrichment and health of communities, and the integration of the “garden” in the breadth of modern civilization. ‘Expanded Field’ consists of two related works based on the idea of different ways of plant propagation. (1) ‘Rhizome’ features roots being divided and grown without soil in gravel culture using hydroponics to improve growth and (2) ‘New Leaf’ focuses on ideas of regeneration by grafting each new leaf using recycled roof slate onto branches from an old white beam tree. Fanny Lam Christie is a visual artist born in Hong Kong and now living and working in Perthshire, Scotland. She is a graduate in Sculpture of Edinburgh College of Art. 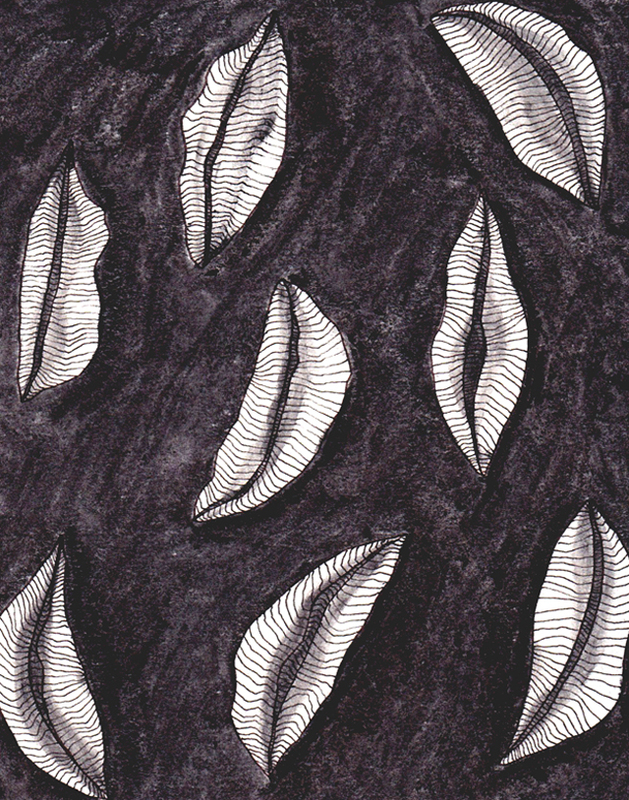 Fanny’s work explores our complex relationship with nature. Her practice includes public art projects, sculpture commissions, site-specific installations and exhibitions. Change is in the air. Soon the old stables at Cambo will take on another function and form creating a new multi-purpose designed space. Change is perpetual. It is everywhere – specific to time and place. ‘The Changing Room’ looks at such fluidity and focuses on that in-between state, when the present, peering into the uncertain future, still lingers on the threshold of the past. Oracles, omens, games of chance and fortune all rely on this concept of uncertainty. ‘The Changing Room’ reflects this ambiguity and contains a series of interventions which look in the light of liminality – and lightly – at that future which is forever just beyond reach. 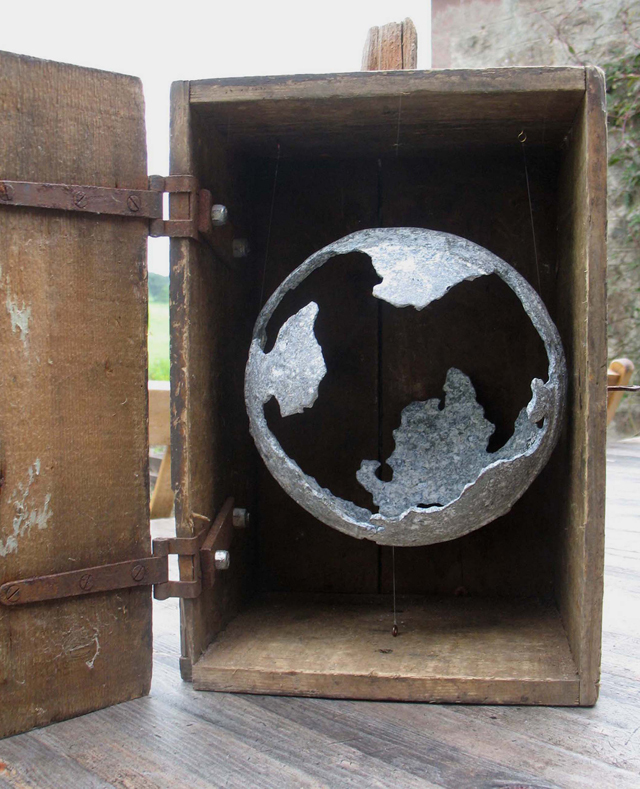 Exhibiting nationally and internationally Kyra Clegg’s work consists of mixed media installations which incorporate sculpture, photography and video. 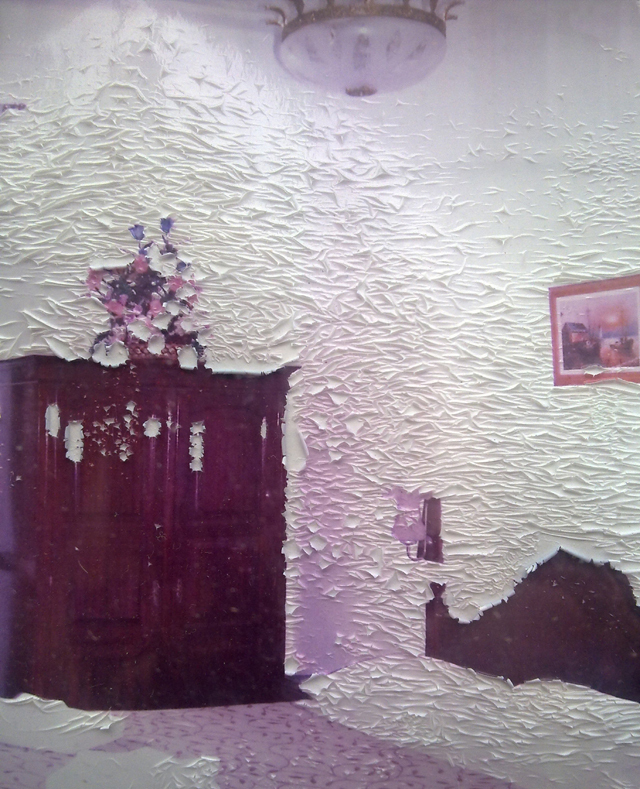 Solo exhibitions have included work on the theme of habitation and memory. She has an ongoing interest in developing work which responds to, and is inspired by specific locations and sites. 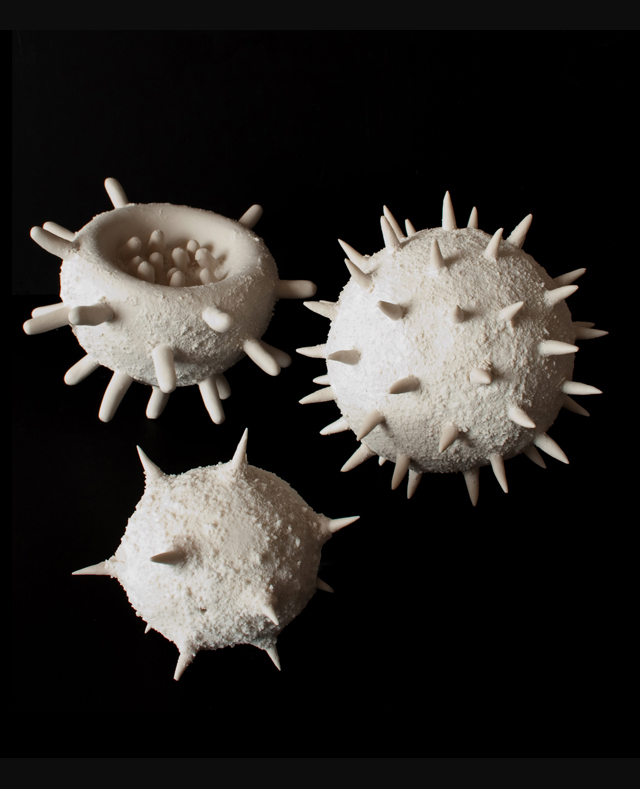 The inspiration for Lorna Fraser’s porcelain work comes from the plant world – she explores the sculptural quality of plants, responding to their structure whilst also capturing a sense of their fragility and sensuality. Fraser’s response to this project was to make work that was site specific to the stables. She noticed that many traces of its past were still there – saddles, troughs, hooks for tethering – the stables still retained a strong identity as a place for horses even though they had been absent for many years. 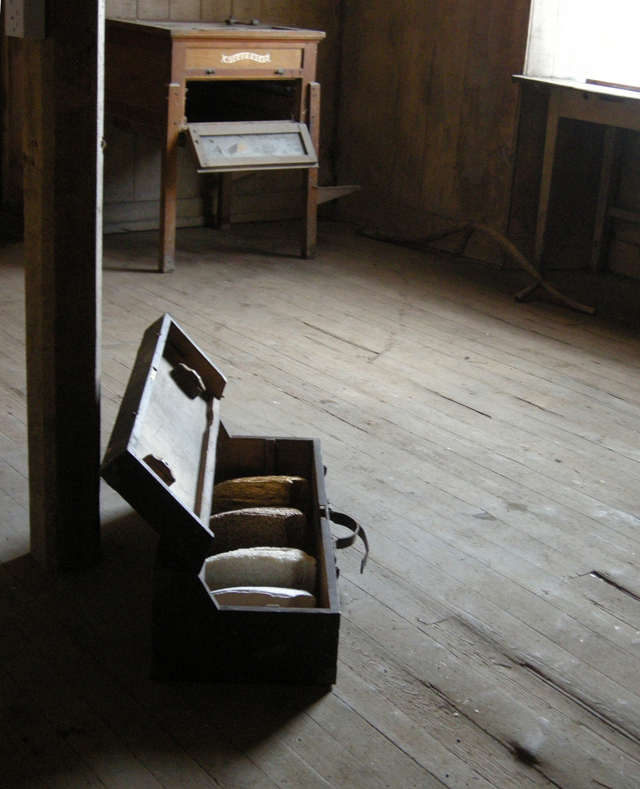 There were even some remnants of hay left in the hake, which gave her the idea that there may even be traces of pollen still floating around the old stalls. This was the starting point for the work – she began to investigate what horses eat, looking at Electron microscope images of the pollen of different grasses, clover, buttercups etc. The resulting “floating” forms were inspired by these pollen images. Taking this idea further she then researched dried specimens of these same plants from the Herbarium at the Royal Botanic Garden, Edinburgh; creating ceramic panels which hang in conjunction with the pollen forms. A graduate of Grays School of Art, Aberdeen, Lorna Fraser exhibits nationally and internationally, most recently in Slovakia with the Society of Scottish Artists and the Philadelphia Museum of Art with Craft Scotland. She has work in the permanent collection of Icheon World Ceramic Center, Korea and Yingge Ceramic Museum, Taiwan. 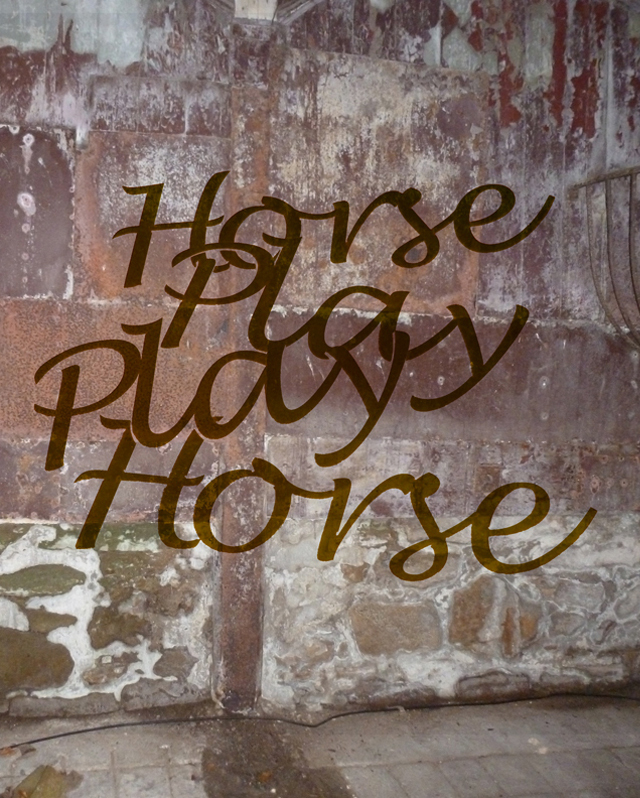 ‘Horse Play’ utilises the atmospheric location of the old stable to consider the relationships between the perceived qualities of the horse and the ways in which these have become absorbed and embedded in our own social language and thinking. Our relationship with all domestic animals revolves around their ability to hear and respond to our words and we judge their intelligence by their ability to comprehend our meanings and emotions. We have in turn, through language, used the qualities and behaviours of the horse to identify and represent our own actions and qualities and social life. These expressions have become so commonplace within our language that they are rarely noticed. 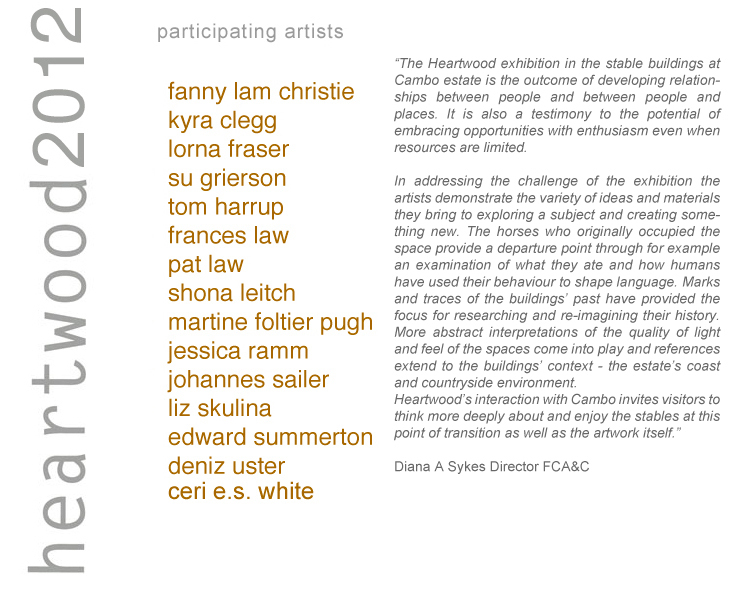 ‘Horse Play’ offers a lasercut selection resonating within the now horseless stable. Su Grierson’s practice looks at land and landscape in ways that critique the relationship between rural locations or situations and human social interactions. Working with images, sound, video and installation she works in many countries. She graduated BA Hons First class (fine art) from Duncan of Jordanstone College of Art in Dundee and MFA from Glasgow School of Art. 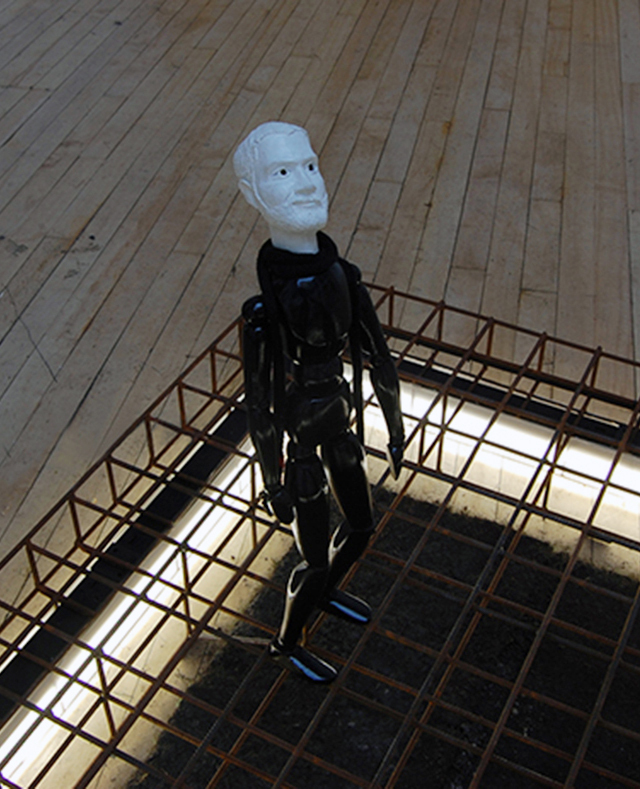 Internal Tourist is a culmination of work completed on a residency at Scottish Sculpture Workshop in 2011. Responding to the landscape of abandoned farm buildings, and utilising horse dung as a medium, Tom created several elevated voids and passages using a Bronze-Age mold-making technique. An intrigue into the varied topographical layering of the cities Tom has resided in, and his experience of the underground cities of Cappadocia, Turkey, have given importance to an awareness of place and duration, and of uncovering the ‘unseen’; for instance Glasgow’s rail and river networks, Cardiff’s docklands, and Brighton’s engineering marvels. Tom accumulates material to form and conceal interior space, projects light across subterranean tunnels, or inverts objects to reveal discreet components. Obsolete technology is recalled and remodeled and imaginary technology is formulated as a kind of film set prop. Tom Harrup originates from Brighton. He completed a Foundation Diploma at Leeds College of Art and Design, a Fine Art BA at the University of Wales Institute, Cardiff, and an MFA from the Glasgow School of Art. 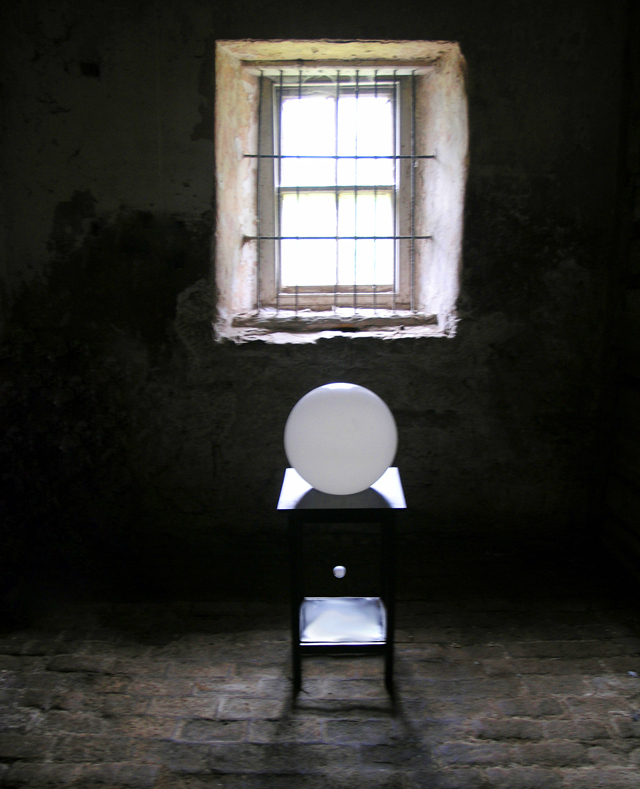 He has since continued his practice at Glasgow Sculpture Studios, sometimes collaborating with his wife Deniz Üster on hybrid scientific installations – shown at La Giarina Contemporanea, Verona, and Cupar Arts Festival in 2011, and StAnza Poetry Festival, St Andrews in 2012. Tom works as a technician for several local galleries and artists, and most recently for the GSA MFA course. The story of our evolution through the lives of our early ancestors is full of adventure; hidden within the depths of our planet lie clues, mystery and intrigue. Gradually a precise picture is revealed of a culture of innovative thinkers; tool makers, warriors, artists and musicians spanning millions of years.Museums are full of things we have found throughout the ages. 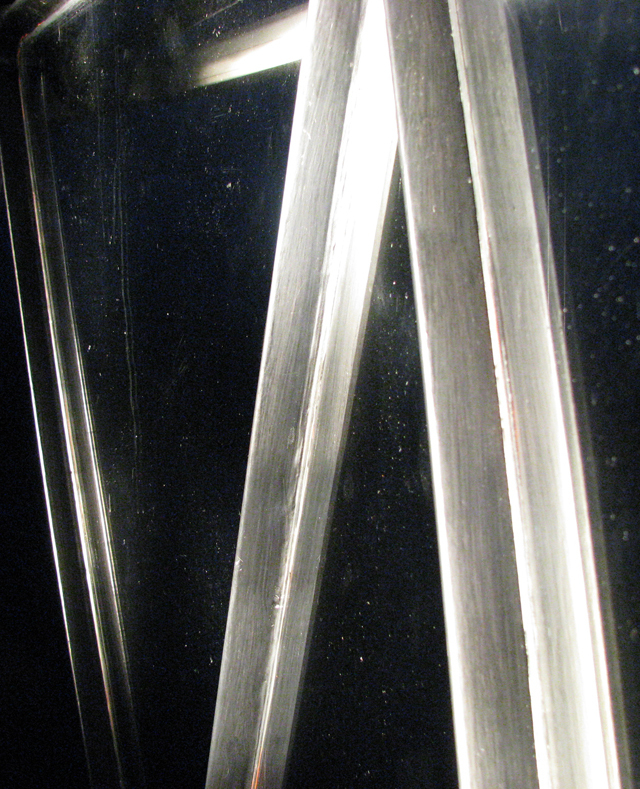 Science has made an art from labelling, classifying and displaying these objects. Treasures are things we love and cherish reminders of our deep seated connection to the natural world and to the past. 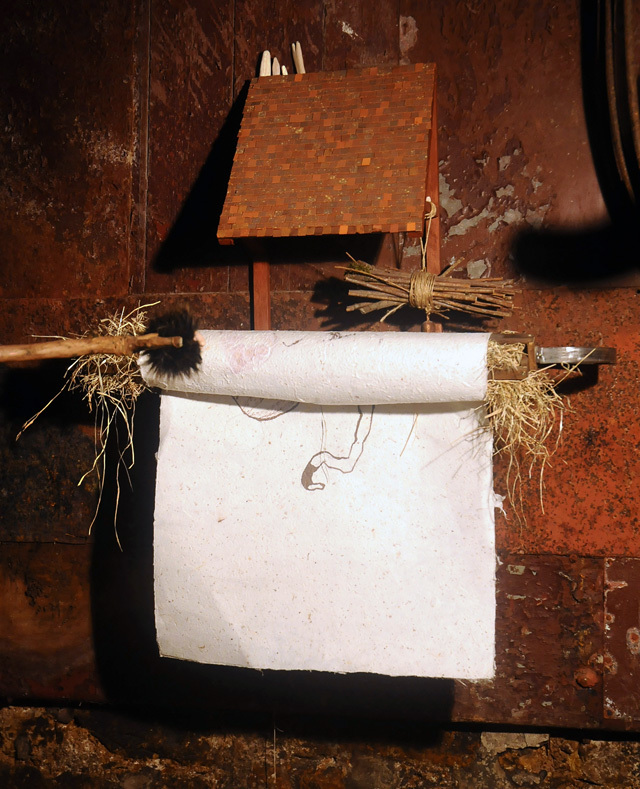 In this piece Frances Law has created a small museum showing ordinary natural and handmade forms. Some of these forms were collected from the beach and woodland at Cambo Estate, others have come from further afield. She has adapted these objects to create museum artefacts and has labelled, classified and presented them as archaeological finds. The intention was to make a piece which is both intriguing and amusing.Frances Law was born in Scotland and is based in rural Angus. She is a Fine Art graduate from Glasgow School of Art. A painter and mixed media artist, she also works with installation. Her work has been shown extensively in many group and solo exhibitions in the UK and internationally. She has won numerous awards and her work is held in public and private collections at home and abroad. Dark days preceded the arrival of the Bell Rock light in 1811. Many fishing and trading boats were wrecked on the ominous reef, many lives claimed and livelihoods lost, many hopes and fears crushed or confirmed. The waters around Cambo House were busy trading and fishing routes for sailing vessels heading to and from the ports of Leith and Dundee, as well as the many smaller fishing ports on the Forth and Tay estuary – all at the mercy of the Inchcape reef. It doesn’t take much imagination to visualise the hopes and fears of the seafarers and those ashore connected with the maritime industry, or to sense the relief that the lighthouse inevitably brought. ‘shine’ is a reflection on these hopes and fears. It will be shown in The Kist, a fitted out horse trailer. Pat Law is a visual artist working mainly in collaboration with artists of different disciplines. Her work is prompted by observation of the landscape encountered through voyages or travel. Having studied both art and ecological sciences, she has a strong interest in the natural environment and marginalised cultures, especially in northern latitudes. ‘Erosion’ comprises flowing organic pieces employing a palette of natural colours, patterns and textures echoing those in the local landscape and its shorelines. The pieces reinterpret geological forces, weathering and interactive processes to give an ‘artist-influenced’ rendering of natural outcomes. Shona Leitch works from her studio in Perthshire creating flowing sculptural forms and figurative work. She graduated from Grays School of Art in Aberdeen in 1991 and has exhibited internationally. As well as creating her own work she also runs regular classes and workshops. Rundown buildings exude signs and residues that are powerfully evocative and compete for attention. Among this overload of stimuli, it is easy to overlook the marks on the walls of the stable that have become exposed wherever the top layer of plaster has fallen away. Although each one is quite ordinary in itself, what is remarkable is their profusion, the regularity of their shape and proportions, and the mystery surrounding their purpose. The painstaking technique that created them is reminiscent of contemporary repetitive drawings and completes the transformation cycle of the stables from redundant horse lodgings to tomorrow’s creative space.The impending renovation of the stables made it somehow crucial to bring them into focus and the puzzling question of their existence suggested a whodunit type of narrative. 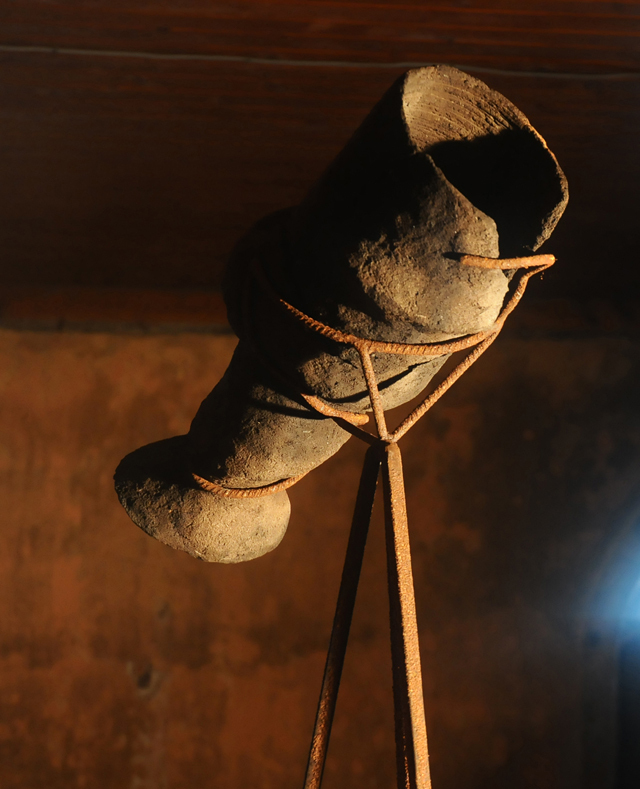 ‘Perhaps’ is an object-based installation and a fictional tale partly inspired by the history of Cambo House at the time when the stables were built. The chronicles of nearby Pittenweem’s witchcraft trials provided further fuel to the imagination. After graduating with BA (Hons) in Sculpture at Edinburgh College of Art in 2006, Martine went on to complete the Master in Contemporary Art Theory and the MPhil in Visual Culture. She has received a number of awards during her studies. She has just completed a series of interpretative texts for the Art in Healthcare collection which is now on public display. “When we speak of the word ‘life’, it must be understood we are not referring to life as we know it from its surface of fact, but to that fragile, fluctuating center which forms never reach.” Artaud It has been said that it was an ancient custom of Scotland’s bards to enter a dark cave and to lie with a heavy stone upon their chests in order to induce visions of the inner eye.‘Blacklight’ questions our current cultural assumption that ‘seeking the light’ is synonymous with conceptual enlightenment. Perhaps an idea should instead be approached by stealth and defined by the darkness surrounding it. Jessica Ramm is a graduate of Duncan of Jordanstone College of Art where she trained as an installation artist, specialising in the construction of ‘Pecking Devices’. Most recently she has been working on a number of residencies across Scotland. These range from building a mobile printing press, The ‘Miraculating Machine’, for the city of Perth, to setting up site specific drip catching installations for Sabhal Mòr Ostaig, Skye. 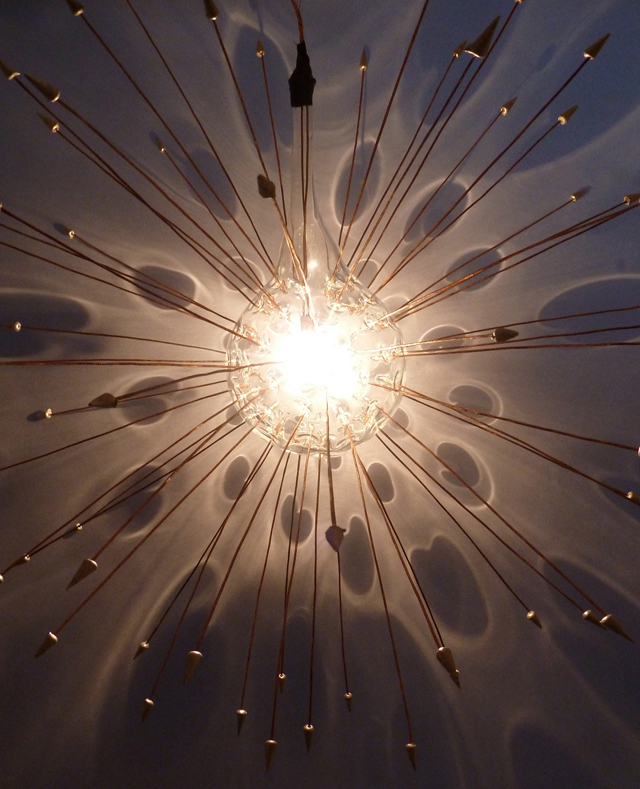 In the coming year Jessica will continue exploring our contemporary experience of flux through the mediums of molten glass and light. The man finds himself inadvertently removed from the familiar space he had created around himself. He is now thinking of how to re-enter and re-establish the familiar setting. To what extent will the memories of his current situation manifest themselves once routine is re-set? Liz Skulina’s practice is primarily based on the archaeology of the space, using its history and artefacts as a starting point to create works which aim to discover and realise our sense of collective identities. Events, objects, materials and occupants provoke personal memories, narratives and associations but also reveal a common ground of shared experiences. 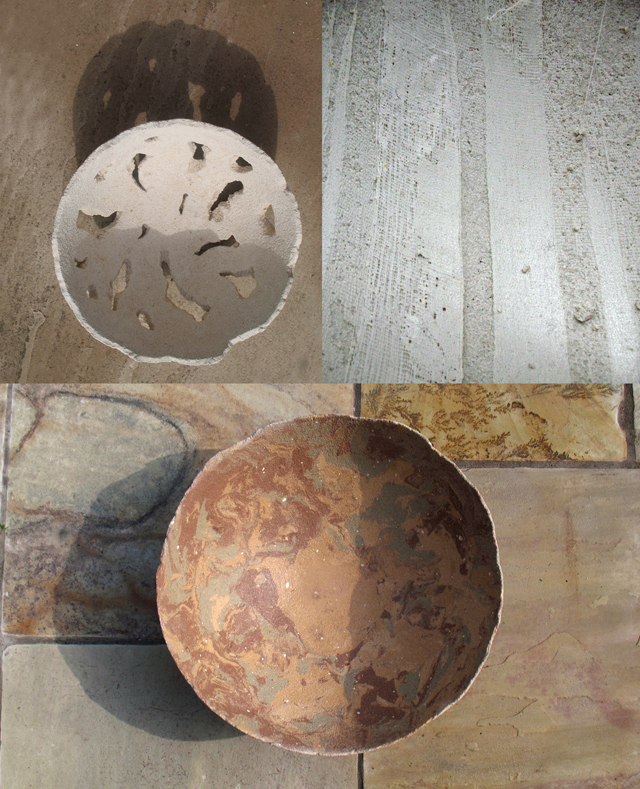 As well as digital media, Liz often uses familiar objects, materials and techniques located within society, culture and the environment in order to express her ideas, the finished form and media of the works, being dictated by the research. 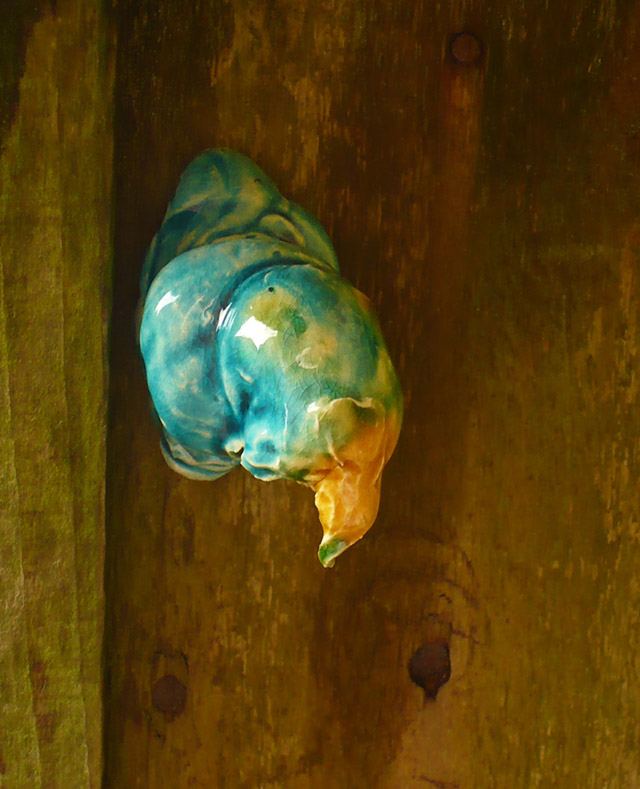 In this exhibition Liz has created an installation in ‘The Tack Room’, which reflects its past, re-presents its present, and looks towards its future, by adapting existing works and creating a new site specific work. Liz Skulina graduated with a BA (Hons) first class in 1999, and a Masters in Fine Art in 2001, both from Duncan of Jordanstone College of Art in Dundee. A prize winner for sculpture at the Royal Scottish Academy, she was made an Associate of the Royal Society of British Sculptors in 2003 and was selected for 50over50 exhibition at the University of Brighton in 2006, which aimed to show the works of the fifty most innovative artists in Britain over 50 years old. Liz works from her studio in Cupar in Fife, and has won a number of prizes and awards. Edward Summerton’s fascination with the representation of nature and natural history can sometimes cause more concern than satisfaction. He continues to make works of almost pure misdirection; simultaneously invitational with skill of hand, yet isolating with the idea-spasm of a half recognised horror image. Culled from some perfectly fabricated diorama from the Museum of Doubt, his environments replicate the spare space existing between the housing schemes and the landscape, which is wilfully scattered with his paintings, books, prints, photographs, sound works, objects and collaborations, like the after effects of an ill fated event of the rural calendar; with the last standing, staggering, horse-mask wearing, goat- horn booted community centre reject, silently sifting through the demented visual remnants. Edward Summerton has exhibited internationally in both solo and group exhibitions as an artist whose work has expanded from the practice of painting into photography, sound works, prints, objects, collaborations and the organising of events and exhibitions. He curated Blind Sight where 50 visual artists were invited to submit sound works to be exhibited as a jukebox installation in Scotland and Finland; Doctor Skin, a unique public art event where artists designed temporary tattoos to be worn by the public; Bird of the Devil, a publication collaborating with 17 writers, and Digital VD, a one hour film work involving one minute films by 60 artists. Deniz Üster stages a fictitious ceremony within one of the stalls, whose attendants never appear. ‘Not Here, Not Now’ is a work in which nostalgia and an altered idea of the futuristic coexist in its fabric. Üster’s homeland of Turkey is a mediatory culture deriving mainly from an oral history, going back to Middle Asia, Anatolia, and the Islamic Middle East. As an artist who collaborates with the language of epics and storytelling, she has discovered that no tradition is original, which suggests that influence is an essential tool in the construction of culture. Narrating myths from an unknown future, Üster invokes vaguely familiar rituals from Anatolian folklore, intertwined with Middle Asian Shamanism and Islamic mythology. She then remolds these in the post-industrial landscape of Glasgow, where kinetics permeates into her works with an aesthetic that is at once Victorian and sci-fi. Glasgow based, Üster (b. Istanbul) has an undergraduate degree in Painting and Drawing from Mimar Sinan Fine Arts University, an MA in Visual Arts from Sabanci University, Istanbul and an MFA from The Glasgow School of Art. She has recently completed a three-month residency in Dubai supported by Art Dubai, Delfina Foundation, DCAA and Tashkeel. In 2011, she was selected to represent Turkey for the Henkel Art Award, and was nominated and shortlisted for the Sovereign European Art Prize. Her solo exhibitions in 2011 included Invited and Volunteered, Rampa, Istanbul and Encrypting Signs on the Fabric of a Rhizome (in collaboration with Tom Harrup), La Giarina Gallery, Verona. The Cambo Estate stables are an intriguing collection of spaces, full of nooks, unexpected shapes, textures, and colours. Much is left that relates to the original purpose and use of the building by horse and human; but other smaller organisms have made their contribution to the underlying layers of texture, colour and general ambiance of a building no longer in regular use, right down to the quality of light that penetrates the windows. Ceri’s intention is to celebrate the contributing residue left by years of hidden occupation and cycles of messy life before much of it is (literally) swept away for the coming stable renovations. Things: sometimes unidentifiable things, textured things, dried things, damp things, excreted things… Scale notwithstanding, this is the chance to glory in the beautiful possibilities of what we might find if we look hard enough with a keen eye and a playful imagination. Ceri White graduated with a BA (Hons) in ceramic design from Gray’s School of Art in Aberdeen in 1991. She now works from her studio in rural Perthshire specialising in contemporary decorative ceramics for the home. Her work is stocked by independent boutiques and galleries around the UK and many one-off pieces are held in collections round the globe.